The Indian King Tavern: Where the State of New Jersey was Conceived ~ The History Girl! Where exactly did New Jersey become a state? It was not Trenton, Elizabeth, or the provincial capitals of Burlington or Perth Amboy, as most would guess. In September 1777, the New Jersey Legislature was meeting in Haddonfield, at the Indian King Tavern. It was at this location that our early government leaders unanimously resolved "...that the word 'State' should be substituted for 'Colony' in all public writs and commissions." Thus, the State of New Jersey was officially conceived in the historic downtown of Haddonfield, a community which still retains its charm and a strong connection to the colonial era. The building which would later house the Indian King Tavern was built circa 1750 by Matthias Aspden, a Philadelphia merchant and ship owner. He constructed a three-and-a-half story brick building along King's Highway, also known as the Burlington-Salem Public Highway. The road was authorized and constructed in 1686 by the General Free Assembly of West Jersey. The first floor of Aspden's building most likely was used as a shop and the upper floors were reserved as a residence. By 1764, the building was enlarged to twenty-four rooms. An adjacent building to the west (right side) became part of the building by creating two door openings between the buildings, which now allowed access to a center hall and staircase. The building was now seven bays wide, creating a bit of symmetry, however the front doors on both buildings were retained. On the eastern side (right side) of the building, a two-story addition with a half-gambrel roof was constructed. It was known as the "ark" and used in conjunction with the tavern until 1842, when it became a general store. This building's basement was connected to the tavern building's labyrinth of cellars. The tavern building is composed of five separate cellars, revealing different methods and periods of construction. Parts of the earliest cellar date to 1732 and were part of the foundation of an earlier brew house that was located on the property. It was torn down to build the future tavern building. As part of Aspden's new building, he included an area under the front sidewalk built even deeper than the rest of the cellar. This space, supported by a brick curved-arch ceiling, was intended to be used for storing beer and wine. The property was purchased by Thomas Redman in 1775. Redman was a Quaker and caused debate in Haddonfield over his outspoken comments on pacifism. In January 1777 he was arrested and jailed for his frequent public pacifist readings. After his release in May, he sold the building to Hugh Creighton. The first tavern license was issued in 1777. However, it was not the first tavern in Haddonfield. In the mid-1750s, a tavern was built near Potter Street and operated by Sarah Norris. It was named the Indian King Tavern, in honor of the Lenape Indian chiefs that once resided throughout New Jersey. The sign outside the tavern featured a profile of a Lenape chief. Norris' tavern was purchased by Mary French, who married Hugh Creighton. When the couple purchased the large twenty-four room property across the street, they transferred the name "Indian King" to the building. Of interesting note is Hugh Creighton's relationship to future first-lady Dolley Madison, then Dolley Todd (nee Payne). Evidence suggests that young Dolley, approximately fifteen at the time, frequently traveled between her family's home on Chestnut Street in Philadelphia and her uncle's tavern in Haddonfield. Raised Quaker, she was prohibited from taking part in the tavern's festivities, but it is said that she took delight in watching the activities that took place there. After her first husband's death in 1793, she would visit Haddonfield once again before marrying James Madison, the fourth president of the United States. The tavern played a pivotal role during the Revolutionary War. It was alternately occupied by Continentals, British, and Hessian troops. Numerous meetings regarding the war were held at the tavern, but none more important than the New Jersey State Legislature. 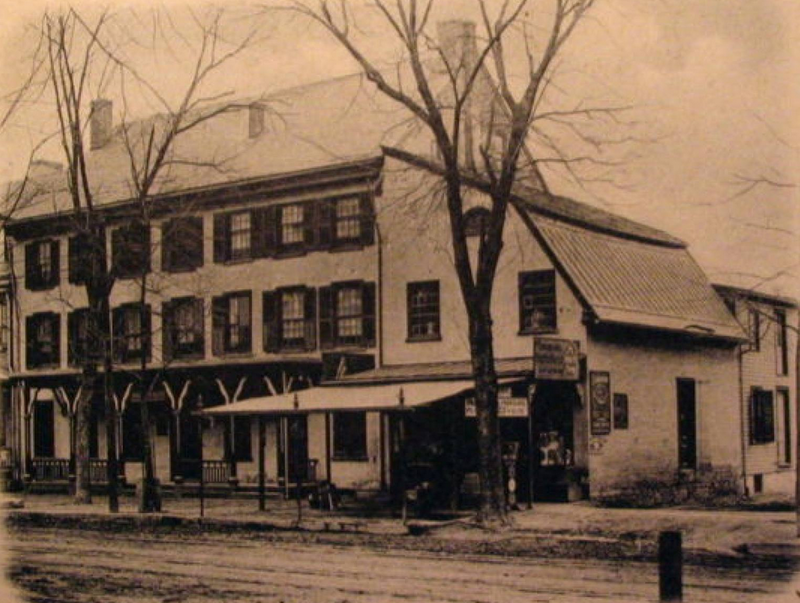 Because of the ongoing battles in and around Trenton, proceedings were moved to the Indian King Tavern in Haddonfield. From January 29 to March 18, 1777, May 7 to June 7, and again from September 3 to October 11, the General Assembly of New Jersey met in the large assembly room on the second floor. The original State Seal of New Jersey. While the Assembly convened in Haddonfield, the Declaration of Independence was officially read into the minutes of the Assembly on February 27, the Council of Safety was formed to investigate suspicion of loyalist activities on March 15, and the Great Seal of the State New Jersey, designed by Pierre Eugene du Simitiere, was adopted in May. Of most importance, on September 20, 1777 the Assembly unanimously resolved "...that the word 'State' should be substituted for 'Colony' in all public writs and commissions." From that day forward, New Jersey was no longer a colony, but a sovereign state. The tavern remained under Creighton's ownership until 1790 when it was sold to Samuel Denny. Denny owned the building until 1805, when it was transferred to to John Roberts. During the nineteenth century, the building transferred ownership numerous times. The establishment changed names numerous times and was known as the Old Tavern, American House, and Roberts Hotel. In 1873, Haddonfield passed a law prohibiting the sale of alcohol. In 1874, the tavern was renamed the American Temperance Hotel and the last innkeeper was George Higby. According to the Historic American Building Survey (HABS), the last alterations took place in 1885 when the roof on the third floor above the western end of the building was raised and a new front porch was constructed. The attached "ark" building operated as a general store until 1908. 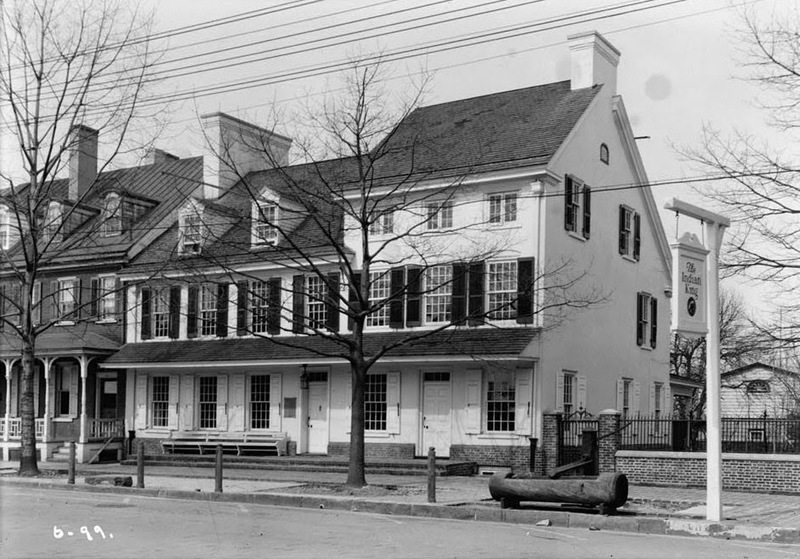 On June 15, 1903 the Indian King Tavern became New Jersey's first state historic site. Actively in use since the 1750s, the building experienced additions, alterations, and numerous periods of redecorating. From 1908-1910, the building underwent restoration by the State of New Jersey in order to return it to its original appearance. The "ark" building was removed from the structure, in addition to returning the western section of the building to two-and-one-half stories from three. A pent roof along the front of the building was reconstructed and the layout of the interior was restored based on architectural evidence. Period doors, moldings, and millwork were reproduced where necessary. In many respects, the restoration can be considered "colonial revival." Much of the restoration of the 1920s was well-intended, but misguided. The loss of the "ark" building has left modern-day historians with many questions about its layout and use. It is hoped that future archaeological projects may yield some answers to these questions. In 2005, archaeology students from Burlington County College spent six weeks excavating numerous areas of the tavern's rear yard. A 4,000-year-old stone Indian tool as well as several thousand other artifacts from the eighteenth and nineteenth centuries were recovered, giving the students, historians, and the public a small glimpse of what life may have been like at the Indian King Tavern. Although taverns have been replaced by rest stops and roadside motels, their importance as a community gathering place and as an ancillary part of transportation infrastructure cannot be diminished.